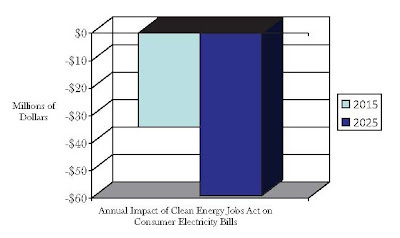 The Union of Concerned Scientists has released a study on the 25% Renewable Portfolio Standard and Energy Efficiency provisions within the Clean Energy Jobs Act (CEJA), confirming the findings of the Public Service Commission that CEJA will result in lower electricity bills than under a business as usual approach. With a 25% Renewable Portfolio Standard, consumer electricity bills will be $34 million lower in 2015 and $59 million lower in 2025, compared with a business as usual approach. CEJA will result in cumulative cost savings to electricity ratepayers of $140 million by 2025. The report concludes that the Clean Energy Jobs Act will protect consumers from rising energy prices by investing in local sources of energy with stable and predictable long-term costs.